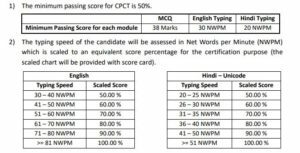 Download Hindi and English Typing Master for CPCT exam according to latest pattern. Just read the post thoroughly and download the Hindi Typing Tutor for practice. Complete guide and typing software for CPCT typing test available here for you. CPCT stands for Computer Proficiency Certification Test. It is taken by Madhya Pradesh government. The score is compulsory for various government jobs in Madhya Pradesh. In many posts the candidate must have a CPCT certificate to get that job. CPCT involves both computer knowledge plus typing skills on computer. In this post we will talk about typing only. CPCT is conducted throughout Madhya Pradesh in various cities like Bhopal, Indore, Gwalior, Jabalpur, Ujjain, Sagar and Satna as examination centers. CPCT Typing exam is taken in both Hindi and English languages. Candidate must pass the typing test in both languages. There is no choice so learn both Hindi and English typing. If your speed is more than the minimum typing speed then you will get more marks. Let’s discuss English typing first. English typing is easy to learn and practice. All you need is a typing software and computer system/laptop. You need minimum 30 WPM typing speed to pass CPCT. There are many free English typing software available to download and practice. You can install any software and learn English typing quickly. If you are looking for a free typing tutor for English according to CPCT pattern then Soni Typing Tutor is best for CPCT typing. It is free for English typing and typing pattern is same as CPCT. Hindi typing test of CPCT is taken on unicode mangal font. There are other Hindi fonts also used for Hindi typing like Krutidev, DevLys etc. CPCT takes test only on mangal Hindi font that’s why we should consider only mangal Hindi typing only. There are two most widely used keyboard layouts available for mangal font typing. CPCT allows candidate to choose anyone of his/her choice. You can choose according to your choice. Remington Gail or Inscript which should I choose? If you don’t know Hindi typing and you are just planning to learn Hindi typing for the first time then we recommend you remington gail layout because remington gail layout is much easier and faster way to type Hindi as than inscript layout. Another reason behind using remington gail layout over inscript layout that remington layout is almost 80% similar to Krutidev/Devlys font Hindi typing. In various Hindi typing tests krutidev or devlys font is also used. In such situation if you learn remington gail layout for mangal font then it will help you to learn krutidev font typing also. So it will be a better choice again. If you already know Krutidev or Devlys font Hindi typing then you should learn remington gail typing then you should choose remington gail layout because both are 80% similar and there are some difference that can be get easily. If you already know Hindi typing with inscript layout then you should choose inscript layout because there is no point in learning remington gail layout from start so if you already know inscript Hindi typing then you should choose inscript Hindi typing in CPCT exam also. Off course remington gail layout is the easiest to learn and fastest in typing Hindi. Inscript is very hard to learn and typing takes a lot of time. Most candidates choose remington gail layout for Hindi typing. You need minimum 20 WPM typing speed in Hindi typing. There are plenty of English typing tutors for download but when it comes to Hindi typing tutors there are no that much alternatives. Soni Typing Tutor is the best choice for CPCT typing exam as well as other typing exam across India. It is available for both English typing and Hindi typing. Soni Typing Tutor has all Hindi typing fonts and layouts like mangal font, krutidev font and inscript, remington gail layout. You should start learn English typing first with Soni Typing Tutor. It’s free for English typing. Once you learn English typing then you should start learning Hindi typing. We advise to learn English typing first because it is easy and you will learn many things like how to press keys on keyboard, how to use keyboard, where to put your fingers and palms and so many things. After English typing you can start learning Hindi typing. There is no shortcut to typing. You should practice daily on regular basis. Practice, practice and practice is the key to learn typing. Typing takes time so have patience. Soni Hindi Typing Software is one time investment in your life you have to learn typing only once. It saves your time taken in typing all your life afterwards so learn typing for CPCT and also as a a time saving skill. Have any questions regarding CPCT test please ask us in comments. You can ask for any guidance or help on our WhatsApp number 7424910327. You can also make a call at 7424910327.